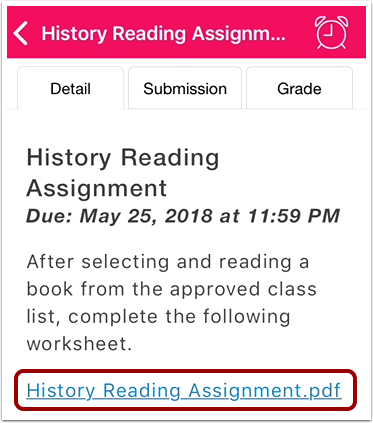 How do I submit a PDF assignment with annotations in the Student app on my iOS device? Canvas allows you to add annotations to PDF files for assignment submissions. Available annotations include highlight, underline, squiggly, strikeout, free text, and drawing. 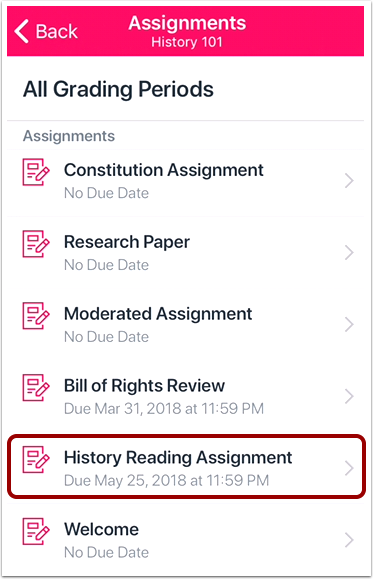 Tap the assignment you want to open. On the toolbar you can manage your annotations. To add highlight, underline, squiggle, or strikethrough annotations, tap and hold the Text Formatting icon . To type text or add a comment, tap and hold the Free Text icon . To add thin drawing, bold drawing, arrow, line, or shape annotations, tap and hold the Drawing icon . To undo changes, tap the Undo icon . To move the toolbar, tap and hold the drag handle , and move it to the new location. The toolbar can be relocated to either side of the screen. The Text Format option allows you to highlight , underline , squiggle , and strikethrough  text. The Free Text option allows you to add text  or add comments . The Drawing option allows you to draw thin lines , bold lines , arrows , and lines . Tap the arrow to view additional shape drawing options . When you are finished adding annotations, tap the Close icon. 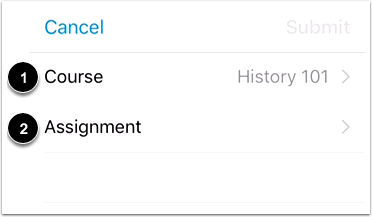 Tap the Submit Assignment button. 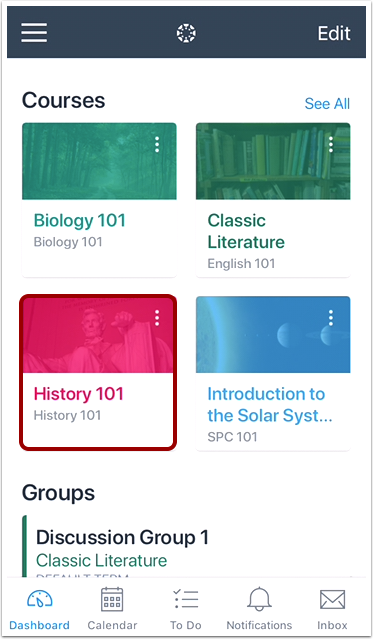 Tap the Course link  and select the course from the list. 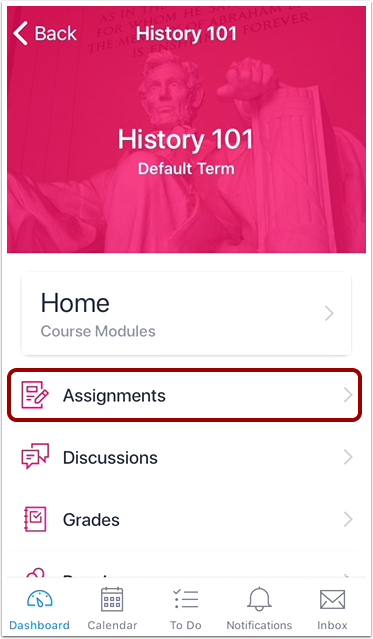 Then, tap the Assignment link  and select the assignment title from the list. 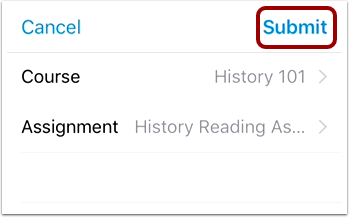 Previous Topic:How do I submit an assignment from a third-party app to the Student app on my iOS device? 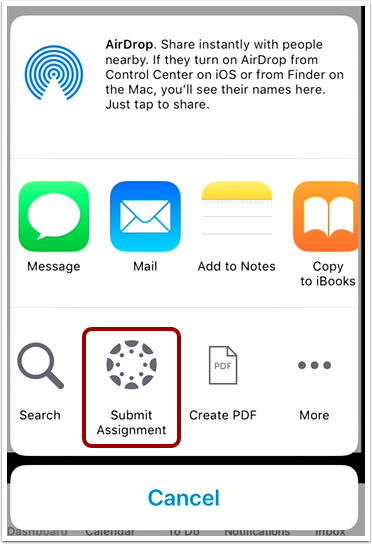 Next Topic:How do I resubmit an assignment in the Student app on my iOS device? Table of Contents > Course Features > How do I submit a PDF assignment with annotations in the Student app on my iOS device?